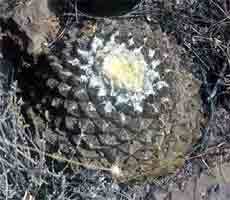 Ariocarpus fissuratus intermedius, a very large old plant in the Sierra Paila. 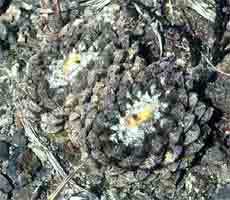 Ariocarpus fissuratus intermedius, a twin headed plant of this large growing form. 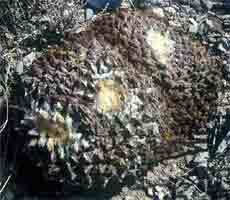 Ariocarpus fissuratus attains massive proportions in the Sierra Paila, plants up to 30cm in diameter occur. The plants found here are intermediate between the intermedius and lloydii forms, reflecting the continuous cline of body morphology from the northern populations in Texas and the southerly lloydii type characterized by the plants at Parras.